Everyone’s favorite flying car shifts into another dimension as the intrepid Tooting family zooms back and forth through time. When the Tootings return to Zobrowski Terrace at the end of Chitty Chitty Bang Bang Flies Again, they find that home is looking a lot like Jurassic Park. But this is no theme park—a very real and very hungry Tyrannosaurus rex is charging them! Thanks to Dad inadvertently yanking Chitty’s “Chronojuster” lever, the spirited car has flown them back to prehistoric times, where the family—and especially Baby Harry—has a narrow escape. 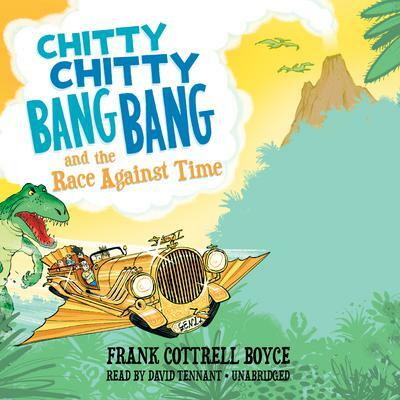 But Chitty has a mind of her own, and the Tootings will get an unexpected tour of exciting times and places from Prohibition-era New York, where Chitty wants to compete in the famous Prix d’Esmerelda’s Birthday Cake race, to the lost city of El Dorado and back again, with misadventures and surprise stowaways along the way. Get ready for a hilarious high-flying adventure, with celebrated author Frank Cottrell Boyce behind the wheel. Everyone’s favorite flying car shifts into another dimension as the intrepid Tooting family zooms back and forth through time. When the Tootings return to Zobrowski Terrace at the end of Chitty Chitty Bang Bang Flies Again, they find that home is looking a lot like Jurassic Park. But this is no theme park—a very real and very hungry Tyrannosaurus rex is charging them! Thanks to Dad inadvertently yanking Chitty’s “Chronojuster” lever, the spirited car has flown them back to prehistoric times, where the family—and especially Baby Harry—has a narrow escape. But Chitty has a mind of her own, and the Tootings will get an unexpected tour of exciting times and places from Prohibition-era New York, where Chitty wants to compete in the famous Prix d’Esmerelda’s Birthday Cake race, to the lost city of El Dorado and back again, with misadventures and surprise stowaways along the way. Get ready for a hilarious high-flying adventure, with celebrated author Frank Cottrell Boyce behind the wheel.